The small township of the scenic Drass valley has developed into a fond tourist spot these days. The location of this wonderfully cool and pleasant tourist spot is that it lies west of the famous Kargil on the road taking you to Srinagar. If you wish to gather more information on this fascinating tourist spot, the Drass tourism guide below might help. So read on. Draped in style by the fascinating Himalayan mountain range, at an altitude of 3,400m above sea level, en route to Srinagar, lies the beautiful Drass valley. It is located 60 kms to the west of Kargil district, at the entrance to Ladakh, the land of passes. The town comes second (first in India) in the list of coldest places on earth where human civilization exists. The temperature over here drops down to as low as -40 degrees during winter, while summers are cool. The summer months are accompanied by frequent soft drizzles as well which make the climate all the more pleasant. It is during this time of the year the Drass valley attracts the mountaineers and trekkers who love to indulge into adventures, the most. Over the years the place has come up as an important tourist destination of the country. One can travel by road, rail or air in order to reach Drass, however, flight or train would take you only to the nearest cities. The airport closest to the Drass valley is Leh, the capital city of Ladakh district while the rail station that is at close quarters to the beautiful valley town is Jammu. 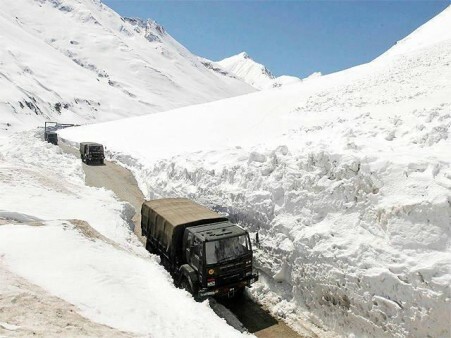 However, there are buses running back and forth from Srinagar to Leh or Kargil through NH1 which drop by Drass on its way. The usual halt time for buses is about 10 minutes. Such busses are available from morning till afternoon. However many get cancelled due to bad weather and other similar reasons. Another option to reach Drass is to avail Jeep or other cars. Best option for single travelers or those who opt for trekking is to avail shared cabs. If you are travelling in a group (say consisting of 7-8 heads) it is better to hire a cab or a car and set out for the journey to Drass. An important point to remember: Travelers heading to Ladakh from Srinagar are needed to book their names at the Tourist Registration center in Drass. The primary place of accommodation at this place is the government tourist lodge which hosts a varied range of rooms, from suites or deluxe rooms to executive or economical ones. Since hotel options isn’t much over here so a wise decision would be to book the rooms prior to your reaching the place. Rooms can be booked from the tourist registration center at Kargil. However, apart from this government run tourist lodge, a few other private hotels have also come up the valley in recent times. Visitors entering the town would be welcomed by a signboard that stands as a proof of the fact that Drass is the second coldest place on earth. The main town caps a distance of not more than 150 meters along the rugged terrain and highways. There are brightly colored wooden and brick houses, not much big, which stand on both sides of the narrow roads. Also, there is a fairly big mosque in the town where the local people offer their prayer. Apart from this, Drass hosts a number of monasteries and there is a common market place for people to buy stuffs for their regular use. Strolling along the roads is the best option if you want to take a tour across the town. There are several hotels and dhabas over here where your pocket pinch won’t be much. Dry foods such as biscuits, fruits or the sponge cakes which is a specialty of the place are a must have if you are visiting Drass. Pure vegetarian dhabas are also available here. The Drass valley is well acclaimed as a trekking zone for the mountaineers. If you are a pro and want to dive deep and lose yourself amidst all the adventures, opt for the long treks that Drass offers you. For the young guns who want to get a taste of risk in unexpected undertakings, short trek is a good option. 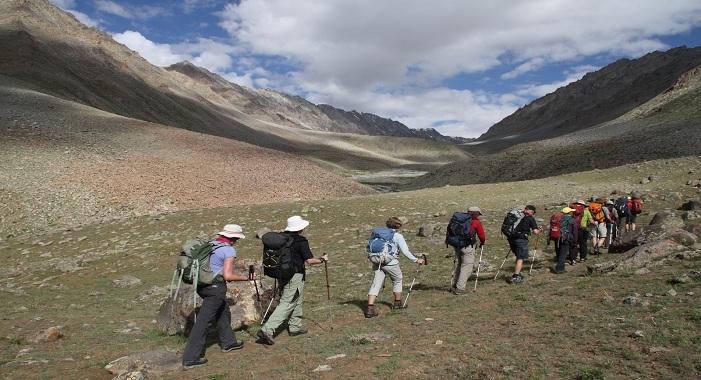 One of the most sought after trekking option is the one from Drass to Suru valley. 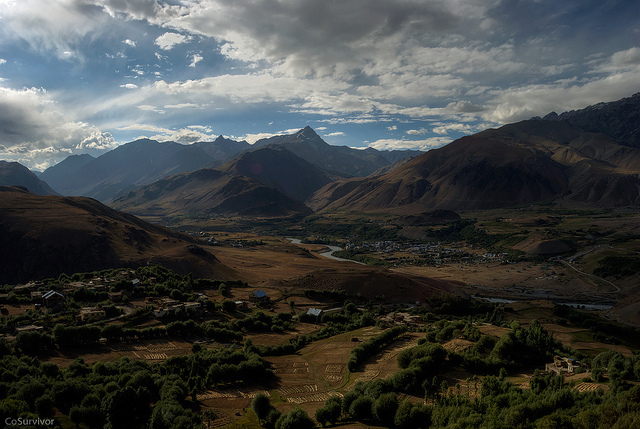 One gets a prefect view of the picturesque highland villages in course of the trek. On the way falls the Umbala Pass which is a major tourist attraction. The place is covered by lush meadows with beautiful flowers on both sides of the pass, which make it look all the more attractive. The trekking takes 3 days to get completed and can be one heck of an adventure particularly if you are coming with a large group of people. It is pretty demanding to complete this trekking and requires a lot of physical toughness in you. Another trekking option is the famous 3 days long trek to the holy Gumpha of Amarnath. Zoji La: The word ‘La’ means pass. One prime tourist attraction over here is the Zoji La. It is from the base of the Zoji la that the Drass valley starts. This pass is well known as the Himalayan entrance to Ladakh. Over the years, the local residents of the place are bearing with the hardships during winter and travel to and fro the Zoji La even during the snow cladded wintry months to facilitate trade. They also help in transportation of goods and assist travelers to cross the pass. Puga Valley: This lake basin close to the Drass valley, located across the Polokonka pass, is notable for its hot water spring and Borax and Sulphur sediments. Every year hundreds of tourists and travelers take bath in the water of Puga hot water spring as the spring is considered to have medicinal value. Patients suffering from rheumatism and various skin ailments clean themselves in the water of this basin in order to cure their diseases. There are a lot of travelers who visit the place for this purpose ending up with positive results as well. Drass had managed to get much bigger attention worldwide. This is due to the wide broadcasting that was done there during the Lo C issues between India and Pakistan. This has put Drass into the folklore of Indian history. The beauty of the place and the locales here are stunning beyond words. The experience of being at Drass is much beyond a normal tourist spot trip considering the importance of the location. Enjoy the bliss of Drass along with its scenic locations and historical spots with your friends or family whenever you get.